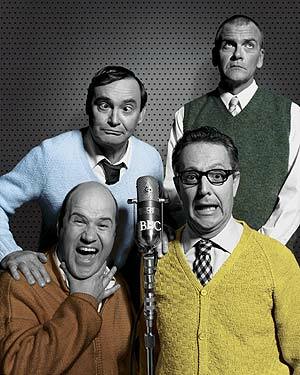 From 1951 to 1960, BBC Radio listeners were the willing subjects of the three kings of British comedy – the Goons. Peter Sellers, Welsh tenor Harry Secombe, and arch-orchestrator Spike Milligan re-invented humour with their surreal blend of sound fx and silly voices, heard by millions through their hit series The Goon Show. With an eclectic cast of characters riffing in such obscure comic harmony that it verged on the metaphysical, the Goons were nevertheless able to deftly blend this high strangeness with a subversive satire that saw them hold aspects of class, commerce, and politics (among others) up to ridicule. While there were contributing writers to the show, the lion’s share of the work was Milligan’s, and it is his story that is at the heart of Roy Smile’s Ying Tong: A Walk with the Goons, presented by MTC at the Art Centre Playhouse. The show opens with a cheeky ‘APPLAUSE’ sign high above a stage set with three microphones, as the Goons take to the floor with their erstwhile announcer Wallace Greenslade (Tony Harvey) in a recreation of the live-to-air radio of the original Aeolian Hall recordings. It is a clever device, making the audience complicit with the anarchic energy that somehow resonated within such conventional surrounds – but it is just a prologue to the meat of the story, which is Milligan’s madness. The curtain soon lifts to reveal the cold and alienated environment of an asylum, and it is here that the central drama of Ying Tong plays out, as the strain of writing the weekly show, combined with the effects of a lasting trauma incurred during the Second World War, see Milligan hospitalised with what was then known as manic depression. From his hospital bed, Milligan (played with exuberance and a gentle pathos by Geoff Kelso) begins the investigation through his own head, indulging in reveries and flashbacks with a wry recognition of the shaky line between what is real and what is imagined. Michael Scott-Mitchell’s set complements this journey well, the receding arches of its asylum inducing a sort of vertigo of perspective, an appropriate backdrop for Milligan’s surreal visitations (one word… leprechauns). It is from within these cold and alienating surrounds that the arc of the Goon’s story is traced – from the meeting of Spike and Secombe during military service in Italy, to the seedy pub above which Milligan lived and where the Goons found their smoky genesis, through to their ultimate dissolution. It all culminates in a kind of psycho-drama where Milligan seeks to heal his fractured mind through the obliteration of his madcap creations in an inner apocalypse, presented as the Goons show to end them all. Smiles has done well crafting a coherent narrative out of the copious material on hand. Far from being a mere tribute to the Goons, Ying Tong is in essence Milligan’s biography. There is an appropriate amount of gravitas to the depredations of Milligan’s mind, the true tragedy of the clown there to see behind the gleeful humour, and while this is Kelso’s show, the support players are perfectly cast and assuredly directed by Richard Cottrell. Jonathan Biggins is absolutely perfect in his portrayal of Sellers – his Dr Strangelove is a triumph of imitation – and David James is solid and endearing as Harry Secombe. Tony Harvey also excels as the slightly bent straight man Wallace Greenslade. It would be remiss of a reviewer not to mention the exquisite sound design, which effortlessly captures the sonic mayhem without which the Goons would seem naked. Paul Charlier and Jeremy Silver have risen to the challenge marvelously, crafting a soundscape to match the twisted dimensions of the set, while lighting designer Damien Cooper creates some eerie and at times epic states that serve to illuminate some of the darker reaches of mind. Fans of the Goons will be well pleased with Ying Tong, but those unfamiliar with their work will also be rewarded by this slickly produced and highly entertaining show. Watching the show, you may find yourself surprised by just how much of an impression these unlikely lads left on the world of comedy, and how truly enduring their influence continues to be. While not a challenging piece of theatre, Ying Tong succeeds in being a magical one.